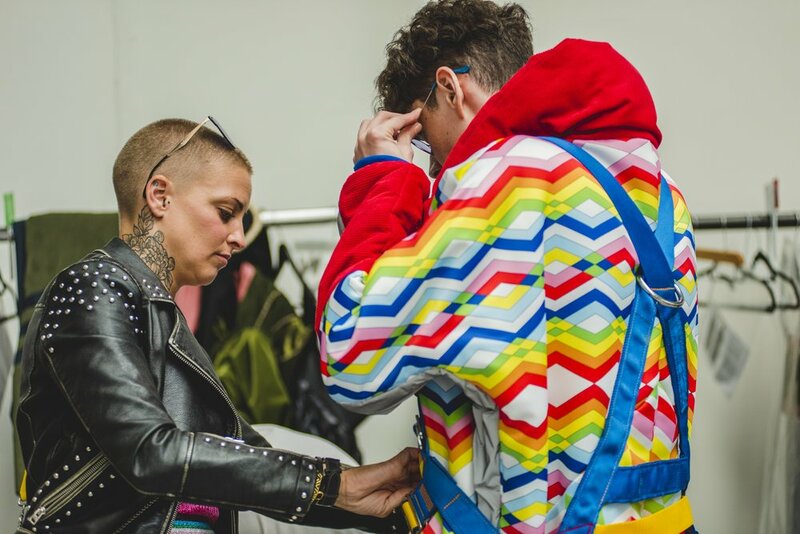 Plymouth College of Art alumni, vibrant designer and mother Amy Bray, spent her time backstage at Graduate Fashion Week 2018, not only styling her pieces but being filmed by the BBC. Amy’s collection, “SIT DOWN SHUT UP!” and her journey to Graduate Fashion Week was filmed by the BBC, as one of the first ever fashions segments to be included on the ‘Inside Out’ local feature. Sponsored by size? footwear for the trainers that accompanied the pieces, Amy’s fresh take on what sportswear can be was inspired by her son’s obsession with football, and the influence of retro sportswear form the 70’s. Her graduate collection explored the potential of print through three primary techniques sublimation print, digital print and screen print. 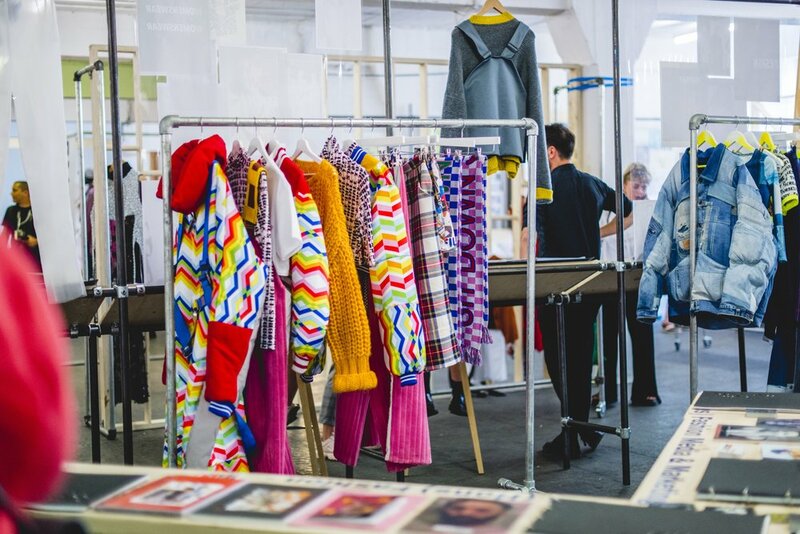 With dreams to design and create kits for sporting events in the future, we catch up with the designer to hear more about her experiences at uni, why she loves collaborating and why becoming a Fashion Buyer wasn’t for her. I attended Plymouth College of Art and the most valuable thing I have learnt is to make the most of every opportunity however big or small. It is also always extremely beneficial to mix with students within other disciplines, and help each other out, even if you’re really bogged down - you never know when you may need each other's help. I have worked with Film, Photography, Print and Graphics and so many more throughout my time at Plymouth College of Art. My collection “SIT DOWN SHUT UP!” was inspired for my son’s love and passion for football, in particular Plymouth Argyle and Rangers. I drew inspiration from retro sportswear as well as the graphics on old school football shirts. The collection was heavily dependant on the print I had created using various techniques such as sublimation print, digital print and screen print. I even took photographs of my sons personal objects related to football to create a specific print. 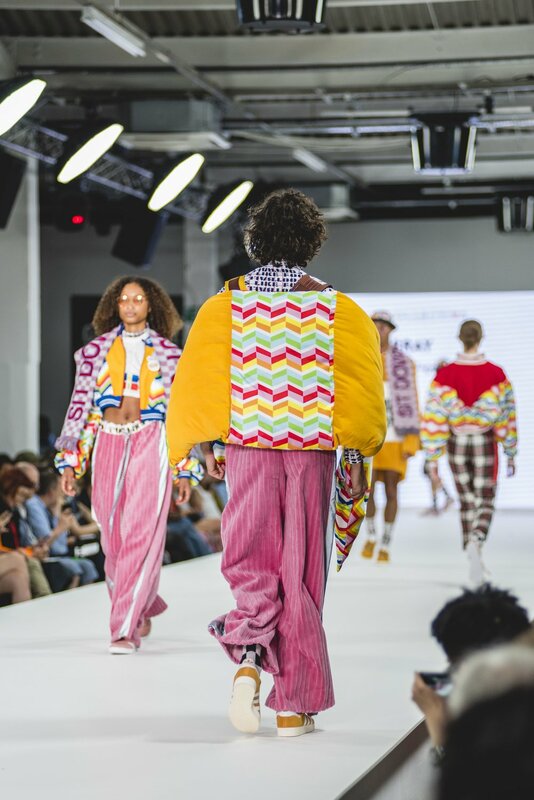 Graduate Fashion Week provides a platform for emerging fashion graduates to showcase their work regardless of the specific discipline. Which area of the industry are you hoping to pursue, and what informed this choice? I am hoping to pursue a career in fashion design, specifically sportswear although originally I thought I wanted to work as a Fashion Buyer! After interning and experiencing what is involved with the role of a Buyer, I decided it wasn’t for me. I was fortunate enough to win a couple design competitions which gave me the confidence to believe in myself and pursue my dream as a Sportswear Designer. I would strongly recommend networking, speaking to as many industry professionals as you can. It’s the most amazing place to be, especially with so many like minded people. Another thing I would say is look at everything for inspiration and ideas to help influence your own decisions moving forward with your work. I loved visiting GFW in my first and second year and realising the things that can be achieved in your final year. As a third year showcasing at GFW, I would just say enjoy and embrace the time as it was one of the most amazing experiences seeing my final collection on the catwalk. Be around to talk to people and promote yourself! Within the next five years I am hoping to either be working as a Designer for a large sportswear brand or even maybe starting my own label. My dream is to design the England football kits for the 2022 Qatar world cup or even my local team Plymouth Argyle. I think within the fashion industry the possibilities are endless and where you think you may end up or want to be in five years can change in an instant. So I’m not setting what my plans are in stone just yet - after filming with the BBC covering the lead up to GFW I wouldn’t mind doing some presenting also. And lastly, if you could give one piece of advice to yourself in first year, what would it be? Oh this is hard…..Well I think I would say believe in yourself and push yourself as hard as you possibly can as you only get one shot at it. My advice to any first year now would be take advantage of every opportunity no matter how big or small and intern, intern, intern.